In the late nineteenth century, James Huntley established himself as one of Holland’s leading builders. Huntley built some of the city’s most iconic landmarks, including the Tower Clock Building and the Castle at Castle Park. On October 10, 1845, James Huntley was born in Kent, England. His father, George Huntley, was a master builder and carpenter. James Huntley followed his father into the family trade, working as a carpenter and joiner for 11 years. In 1868, Huntley married Julia Thorpe of Kent. Julia Huntley’s father, James Thorpe, was also an experienced Kent builder. James and Julia Huntley had six children: George, Mary, Nellie, Harry, Cecil, and Adeline. In 1870, the young couple emigrated from Kent. The Huntleys crossed the Atlantic Ocean and travelled to Michigan. In 1871, James and Julia Huntley settled in the City of Holland. Prior to the Great Fire of 1871, James Huntley established a carpentry shop in Holland. In the wake of the devastating disaster, which destroyed approximately 80 percent of the city, Huntley’s services were in high demand. He secured contracts to rebuild private residences and businesses. Over the course of his career, Huntley oversaw the construction of several of Holland’s most iconic buildings (see Gallery below). In 1884, delegates attending the Reformed Church’s General Synod in Grand Rapids proposed that the academic institution invest in building a stately Presidential manner. The delegates argued that the right home might entice Presidential candidates, specifically New York clergyman Dr. John De Baun, to accept the position. Although De Baun declined the job offer, Synod delegates donated $3,100 and pushed the project forward. Construction began immediately, despite the institution’s failure to raise sufficient funds. Hope College contracted Huntley to build the residence. By 1886, funding for the project had depleted. The partially built home remained boarded up until more capital was secured. Eight years after construction began, in 1892, the President’s House was completed. Huntley also built Graves Hall and Winants Chapel on Hope College’s campus. On October 12, 1892, the cornerstone of Graves Hall was laid. Graves Hall and Winants Chapel were built of locally quarried Waverly stone. At 2:00 p.m. on June 26, 1894, the building was dedicated. In 1882, the City of Holland purchased a lot on 8th Street, between Columbia and College Avenue. City officials hired Huntley to serve as the contractor for Holland’s new firehall. In 1883, construction of the firehall began. Huntley completed Firehouse No. 2 in 1884. In 1892, Huntley’s crew completed Van Putten & Son Bank. 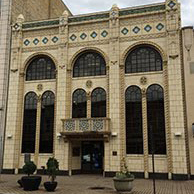 The building, which is located at the intersection of 8th Street and South River Avenue, cost $27,000. Within a year of its construction, local jeweler John Raven installed a functioning clock into the building’s tower. On November 11, 1883, the $500 clock began to tick. The distinctive landmark earned the downtown edifice the name Tower Clock Building. Huntley managed the construction sites of the City Hotel, as well as Hotel Holland. He also oversaw the building of the Michigan Furniture Company’s factory in Holland. In 1862, Philip Phelps Jr., principal of the Holland Academy, along with members of the English speaking Reformed community established Hope Reformed Church. Originally, the Dutch Reformed Churches of Holland only held services in the colony’s primary vernacular, Dutch. From 1862 to 1866, Phelps served as minister of Hope Reformed Church. He resigned from the position upon his election as Hope College’s first president. In October 1871, the Great Fire destroyed Hope Reformed Church. Three years later, in 1874, an orange brick Gothic Revival church was erected. Hope Church’s new edifice was designed by New York architect Carl Pfeiffer and built by Huntley. In 1882, members of Pillar Church, which was originally affiliated with the Reformed Church of America, aligned with the emerging Christian Reformed Church denomination and seized control of the building. The men claimed the property and the building for the CRC; those that remained loyal to the RCA tradition opposed the takeover and brought legal action against the CRC. In the 1883 Michigan Supreme Court Case The Consistory of the First Dutch Reformed Church, Harm Brook, et al. v. Tenuis Keppel et al..The court ruled in favor of the CRC, which was represented by Arend Visscher. The CRC retained control of Pillar Church, but the court ordered that the denomination allocate $200.00 to the displaced RCA members of the congregation for the purpose of constructing a new house of worship. The displaced RCA congregation hired Huntley as its contractor. First Reformed Church’s new red brick building was erected on 9th Street, down the road from Pillar Church. In 1865, Michael Schwarz, a wealthy real estate tycoon from Chicago, purchased land in the southwest corner of Holland on the shore of Lake Michigan, now Castle Park Association. In 1892, Schwarz hired Huntley to build him a retire home on his lakefront property. Schwarz requested that the grand family estate resemble a castle. Construction began in 1893. Stone for the edifice was brought by horse and wagon from a quarry east of Holland. In August 1894, the Castle was completed. Michael Schwarz moved into the estate with his wife, six daughters, and mother-in-law. Within one year, the Schwarz family abandoned the castle and relocated to a new residence in Holland. Several Holland residents employed Huntley to build their family homes. These men included D. Beardsly, H. Boone, John Cappon, George Hummer, G. Kanter, J. C. Post, and A. Verschure. In addition to his work as a contractor and builder, Huntley was also involved in several local businesses. After arriving in Holland in 1871, Huntley opened a carpentry shop on River Avenue and 10th Street. At the site, he produced sashes, blinds, and doors. In 1876, the carpentry shop burned down. On the lot, Huntley erected a planing mill. In 1890, Huntley assisted in establishing the Ottawa Furniture Company, which was located on River Avenue. One year later, in 1891, he purchased the furniture company. In 1893, Ottawa Furniture Company employed 110 men. Huntley remained its president until his death. In 1892, he became president of the newly founded Wolverine Electric Light Company. Huntley’s political views, religious affiliation, and support of Free Masonry distinguished him from the majority of Holland’s Dutch Reformed residents. Prior to the Civil War, Holland’s citizens identified as members of the Democratic Party, which was hailed as the party for the common people. Holland’s Dutch residents, who had suffered under the Netherlands’s aristocratic authority, were kleine luyden, common people. After the Union’s victory and Lincoln’s assassination, the kleine luyden, specifically the Civil War veterans, began to transfer their loyalty to the Republican Public. In the 1868 presidential election, General Ulysses S. Grant received 58 percent of the votes in Holland. The 1868 election marked the start of Holland’s progression towards a tradition of Republican Conservatism. Huntley, who arrived in the early days of the city’s political transformation, remained a staunch supporter of the Democratic Party. Upon settling in Holland, Huntley and his family attended Grace Episcopal Church. In 1867, the West Michigan cities of Grand Haven, Holland, and Saugatuck were formally organized into a parish. Reverend J. 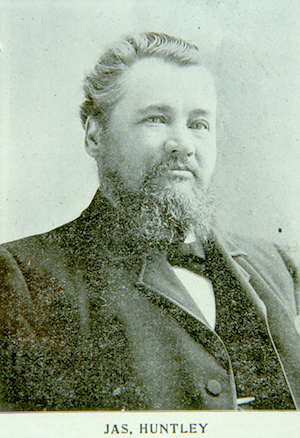 Rice Taylor, Missionary Rector, was responsible for the West Michigan Parish. Holland’s Episcopalians were the targets of frequent religious and ethnic discrimination. As Grace Episcopal Church established itself in the local community, the discrimination its parishioners faced began to decline. Huntley was a member of Holland’s Masonic Lodge (Unity 191), where he served as the Senior Warden. Within Holland’s Dutch Reformed community, Free Masonry was a divisive topic. At the 1868 General Synod meeting, delegates from the Wisconsin Classis urged the Reformed Church of America (RCA) to condemn Free Masonry. While no official action was taken, members of the General Synod unanimously claimed that it was sacrilegious to join a Masonic Lodge. In June 1880, the General Synod confronted the issue of Free Masonry again. Following a lengthy debate, the Synod reissued its previous unofficial statement, asserting that no member of the RCA should belong to an anti-christian organization. Huntley’s membership in an organization unofficially condemned by the RCA further set him apart from Holland’s Dutch Reformed, Republican residents. On August 29, 1899, Huntley died at age 53. As a contractor, he was responsible for executing several of Holland’s most recognizable buildings including Graves Hall and the Tower Clock Building. Huntley’s skill as a craftsman has left a lasting impression of Holland’s cityscape. “Castle Park History.” Castle Park. Castle Park Association, 2014. “Graves Hall Restoration Project.” Campus Development. Hope College, 2015. H88-0077, Huntley, James (1845-1899), Papers, n.d. Joint Archives of Holland, Hope College, Holland, MI. “Holland City Hall & Firehouse No. 2 Historical Marker.” Holland, MI. Groundspeak, Inc., 2015. Web. 23 July 2015. “Our History.” Grace Episcopal Church. Grace Episcopal Church, 2015. Parr, Judy Tanis. Hope Church, Holland, Michigan: The First 150 Years, 1862-2012. Grand Rapids, Michigan: Dickinson Press, 2012. Portrait & Biographical Record of Muskegon & Ottawa Counties, Michigan. Chicago: Biographical Publishing Company, 1893. “Stately 19th Century On-Campus Residence Is Home to Hope College Presidents.” Hope College, 2015.